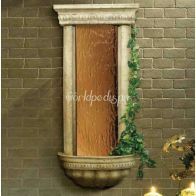 Shipping Cost: PLEASE SELECT 1 Fountain (+$45.00 ) 2 Fountains (+$75.00 ) 3 or More Fountains Call for Freight Company!!! When one thinks of water fountains, they often think of ancient stone structures, perhaps accented with bronze, with water pouring majestically down the structure. 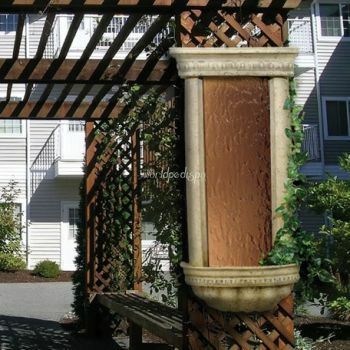 Now, with modern technology and materials, you can have that fountain with all of its ancient grandeur right in your living room, office, or garden. 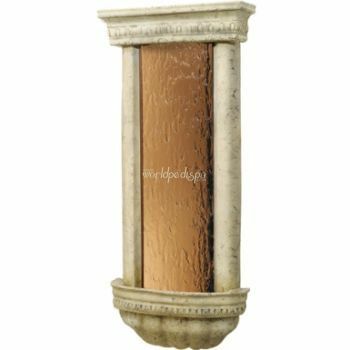 The Bellezza with Bronze Mirror is made of fiberglass and displays a weathered stone finish and a beautiful tempered bronze mirror, combining the best of the old and new effectively. When you watch and listen to the water pouring down the smooth bronze mirror, you will have trouble believing that this is a wall-mounted fountain; you'll think that you are in some ancient oasis and somebody just built a modern building or garden around it. If you want to modernize this water feature to fit more effectively with contemporary surroundings, you can simply turn on the low voltage submersible accent light or have the piece customized with the logo of your choice. These units make great indoor water fountains because they are relatively small, standing at 45 inches and lightweight, but they are tough enough to be installed outdoors, too. Installation is a breeze, taking less than half an hour.